Kwikset Latch Collar, 6-Way, Round Face, Plain Commonly referred to as "Pickle Fork." Use for servicing cylinders. Standard on non-U.L. locksets. Full lip square corner. 2-1/4"H, 1-5/8"CTC. Interchangeable face places - round corner, square corner and drive-in. For the Maximum Security deadbolts. Standard on Nos.780 and 785. 1-3/4" inner CTC, 3" outer CTC. 3-5/8"H x 1-1/4"W. 3-hour fire rating with U.L. Titan and 1-1/2 hour fire rating with U.L. Kwikset locks and latch bolts. Interchangeable face places - round corner, square corner and drive-in. T-strikes with full lip. 2-3/4" x 1-1/8" square corner. For Commercial Grade 2 Latches. ANSI TMS STRIKE. Strike plate for interior or exterior metal frame doors; commercial grade; 1-1/4" x 4-7/8" square corners. Square corner faceplate.Works with a 5/16" Star drive. Used on old style passage door locksets. Includes 1 latch and 1 set of installation screws. 1-1/32" x 2-1/4". Steel adjustable deadlatch core for Kwikset Security, Maximum Security, Ultramax Security entry knobs and levers. T-strikes with full lip. 2-3/4" x 1-1/8" square corner. For Commercial Grade 2 Latches. ANSI TMS STRIKE. Steel adjustable deadlatch with round corner, square corner, & drive-in face plates for Kwikset Security, Maximum Security, Ultramax Security entry knobs and levers. Cylindrical deadlocking latch with 1/2" throw; U.L. Approved 3-Hour Fire Rating, ANSI Grade 2. 1-1/8 x 2-1/4 faceplate. Cylindrical deadlocking latch with 1/2" throw; U.L. Approved 3-Hour Fire Rating, ANSI Grade 2. 1-1/8 x 2-1/4 faceplate. Full 1" throw, solid brass with hardened steel rod insert. U.L. Approved 3-Hour Fire Rating, ANSI Grade 2. Unguarded Latch - For passage and privacy locksets; SV series standard duty cylindrical knob and SK series lever locksets; the square face latch bolt has a 2-3/8" backset; UL listed for "A label" single swing doors. Guarded Latch - For entry, storeroom and classroom locksets; Grade 2 with a 1/2" throw and a 2-3/8" backset; UL listed with a dead lasting function. 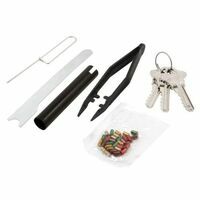 SmartKey Rekeying kit includes a SmartKey learn tool, 4 pre-cut replacement "everyday" keys and 2 pre-cut "temporary" keys. 1"W x 2-1/4"H front. For Kwikset applications. May also be used in place of a plain latch for applications requiring this backset. Polished brass finish. Fast routing of strike and latch plates. Includes high-speed steel router bit No.43670. Will route the following sizes: Strike plates; 1-1/8" x 2-3/4", 1-1/2" x 2-1/4" and 1-1/2" x 2-3/4". Latch plate: 1" x 2-1/4", 1-1/8" x 2-1/4" and 1-1/8" x 2-3/4". A tool for resetting the SmartKey cylinder if it has been improperly programmed. Steel adjustable plain latch core for Kwikset passage knobs and levers. For universal pin series uncoded padlocks. For use on Nos. 1UP (673.6896), 1UPLJ (673.6888), 3UP (673.6904), 3UPLF (673.6870), 5UP (673.6920), and 5UPLF (673.6912). 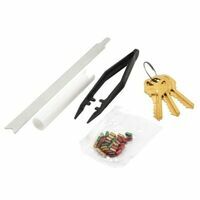 Keying kit snap-tight plastic box. Bottom pins, top pins, pin springs, cylinder caps, cap, pins, key gauge and follower bar.